My rhubarb plants are in a class by themselves. If you give them an inch, they will take over the whole yard. The plants are four feet tall and six feet wide with leaves two feet across and stalks are almost five inches around. I’ve divided them several times in the seven years they have lived here. Their diminutive parents live a controlled life in a neighbor’s yard and I have a friend who has managed to grow bonsai rhubarb; the stalks are the size of a pencil with leaves like baby mittens. I read about rhubarb and discovered “rhubarb is a heavy feeder”. My rhubarb could qualify for “Over-Eaters Anonymous”. You might think that I have heaped fertilizer and water on them, but I haven’t. They just grow…and grow. The lower leaves end up in the compost, but a couple of times a summer I’ll make a rhubarb custard pie. 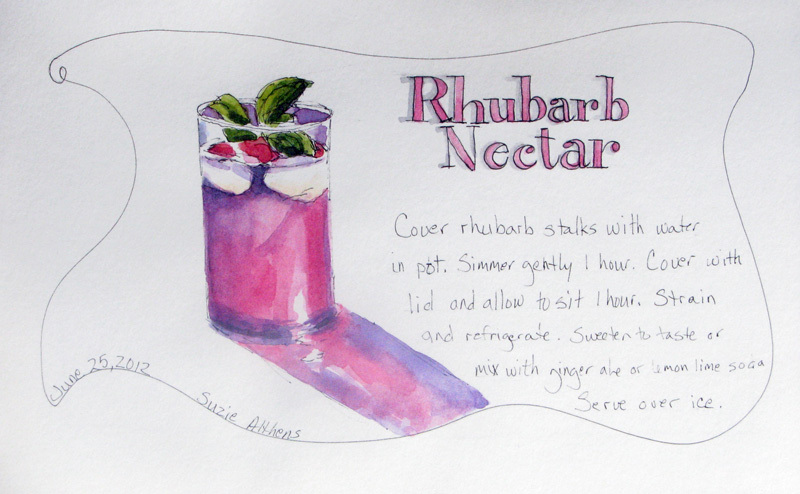 One of my favorite recipes is for Rhubarb Nectar. Let me know if you make it. I’m happy to share if you would like some stalks, or a plant…or two.